I never like typing up a review for a game that I haven't completed, especially story-based ones like point 'n' click adventures since it's hard to give a definitive score for the plot, for example, due to the linear nature of these games (it's hard to rate something you haven't experienced yet). However, I've now got a backlog of several games I've been meaning to review but haven't, because I'm always telling myself I would go back and revisit them at some point. I think it's a reasonable assumption that this is never going to happen with The Samaritan Paradox since I typed up a "First Impressions" article on it back in July 2014 and it's now January 2016. For those that have read my "First Impresssions" article on this game, you might realise this review will sound a lot similar as I basically didn't venture much further into the game after publishing the post. Sadly, I actually had to dig up descriptions of the game's plot because I have forgotten most of the details, except that you're some guy in 1980s Sweden reading these books left from some deceased author that are all set in a fantasy world in which you get to play as the protagonist. Okay, so after refreshing my memory, the "guy" which is the protagonist happens to be a man named Ord Salomon who is an expert at cracking codes and deciphering secrets. He is tasked to help the daughter (Sara Bergwall) of a famous writer (Jonatan Bergwall) to find her father's secret last novel. Along the way though, Ord discovers a whole bunch of other mysteries to solve, like how Jonatan was investigating the weapons industry along with some covert affairs with foreign dictatorships. Ord also has to discover what the book is about and why it's so important that he finds it. Also, there are some questions as to how Jonatan really died. As far as adventure game plots go, it seems reasonably good, and I was intrigued enough to keep going when I originally played the game back in 2014. The only reason I haven't given it a perfect score is that it was obviously not entirely memorable as I had to do some research before typing this review; I was also probably spending too much time wracking my brain over the puzzles instead of just appreciating the story. In terms of the interface used for actually solving puzzles in the game, it's not too dissimilar to many other point 'n' click adventures so I have no complaints about that, the only thing I can fault is the game's difficulty. "... as a true adventure gamer ... I would never stoop to consult a walkthrough." And there you have it. If you want to be a true adventure gamer, don't use walkthroughs. So if you find this game too difficult, you're not a true adventure gamer! And if you can't solve the puzzles on your own, why even bother continuing to play the rest of the game? Ljungqvist does concede that some players have found the game "a bit difficult" and considering one of its puzzles made a list of the 5 Most Unreasonably Difficult Video Game Puzzles Ever, you can get some idea of what kind of puzzles await you when playing this game. If you're a die-hard point 'n' click adventure game fan, you'll probably have not too much trouble playing the game, but for everyone else, I think it'll be a challenge. Oh, there's also no hints system like you'd fine in modern point 'n' click adventures but as mentioned, there are walkthroughs you can check online instead. The voice acting in the game is generally very good, especially when you consider this is an indie game. Ord's voice actor (Anthony Sardinha) is particularly convincing. There aren't too many tracks but they're all top notch thanks to composer Lannie Neely. Some of the tracks definitely capture the feel of the 80s (which is when the game is set). So if you do end up buying the game, make sure you get an edition that comes with the soundtrack :). 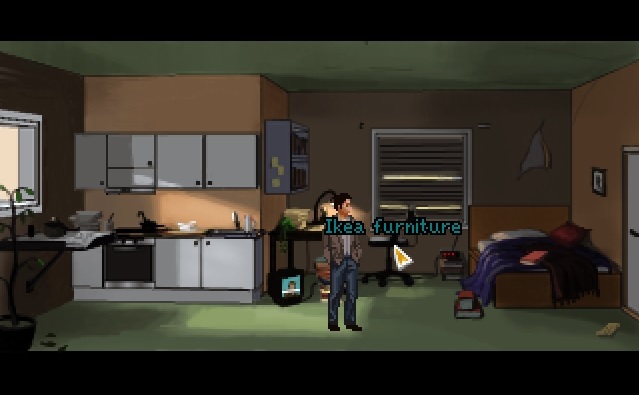 The graphics are similar to many retro point 'n' click adventures that are often made using Adventure Game Studio (AGS) such as Gemini Rue, The Shivah or Resonance. So, if you don't mind the retro graphics, there's not much to complain about except the perspective seems to be a bit off - i.e. sometimes you end up looking like a 50 foot giant when you really shouldn't. As already mentioned, I haven't completed the game and I could never muster the motivation to continue playing. Considering I had to resort to walkthroughs several times, I don't think there's really much point playing a point 'n' click adventure if you have to resort to a solution more than a few times. The game is pretty well polished since it follows familiar mechanics to most point 'n' click adventures. However, there were a couple of annoyances: firstly, the user interface is unintuitive such as a red "X" (which I'd normally associate as a "cancel" button) being the "quit game" button; Secondly, pressing ALT+ENTER has resulted in the screen not minimising (if already playing in full screen) but restarting the game instead. I've managed to lose progress in my game a few times thanks to this little surprise; Finally, I encountered a bug where the mouse would refuse to work after loading a game. The suggested solution involves changing rendering modes but I only ended up having limited success with this approach and I had to resort to playing in windowed mode in order to avoid any further complications. The Samaritan Paradox has most of the right qualities for a top notch, retro point 'n' click adventure game such as great audio and a compelling plot, but I found the game's puzzles a bit too difficult for my liking. If you're the sort to have played hundreds of point 'n' click adventures in the past, or are just a generally more cultured person than I am, you'll probably find a lot to like in The Samaritan Paradox, otherwise, you'll probably just end up frustrated and having to consult a walkthrough non-stop in order to finish the game (and if it gets to that stage, is it really worth playing?). Is the game worth $9.99 USD? : Yes. If you don't mind difficult, retro point 'n' click adventures, this game, which is under $15 AUD, offers hours of gameplay making it good value for money.